In a crowded hotel ballroom near Charles de Gaulle airport in France, speakers on three separate panels discussed the conundrum of Iran and the problems the regime poses for the region and the world. While speakers came from different countries, from political and academic backgrounds, the message was the same: the Iranian regime was the key source of the region’s problems and that the Iranian resistance movement was the most viable pathway for regime change within Iran to a secular, democratic and pluralistic society. The panel discussion, entitled: “Where is Iran Heading? Tehran’s Domestic and Regional Politics” was sponsored by The Foundation for Middle Eastern Studies (La Fondation d’Etudes pour le Moyen- Orient FEMO), an independent organization providing analysis on the Middle East to European institutions, international organizations and individuals, and the Alliance for Public Awareness, Iranian Communities in Europe (APA), comprised of various associations and individual expatriate Iranians living in Europe including a large number of second generation of Iranian expatriates. The line up was a who’s-who is policy wonks, politicians and global influencers who weighed in on Iran’s influence in the Middle East and the role of the Iranian opposition (MEK) movement, especially the best pathway to regime change. Regime change in Iran no longer seems to be a taboo word as U.S. Secretary of State Rex Tillerson cited it in recent testimony; a verbal leap forward from the reluctance of the Obama administration to utter anything that might offend Tehran. Panelists all cited that the environment has shifted so dramatically over the last few months that the prospect no longer seems a fantasy, but now part of concrete policy discussions in capitals around the world. Linda Chavez, founder and chairwoman of the Center for Equal Opportunity and a former White House staffer, cited a need for a “critical mass” of support for a burgeoning resistance movement being led by the National Council of Resistance of Iran, an umbrella group of several Iranian dissident and human rights groups. It was a sentiment echoed by former Democratic Sen. Robert Torricelli who discussed his own experience in seeing the evolution of Iranian resistance groups such as the Mojahedin-e Khalq (MEK) from being ostracized unjustly as part of the appeasement policy towards Iran’s mullahs, to now being welcomed by world leaders seeking a strong partner in dealing with Iran. The speakers reminded audience members that meaningful change was only going to happen from within Iran itself and not through any external manipulation which would only serve the interests of the mullahs in deflecting any efforts from outside as being meddling by foreign governments. 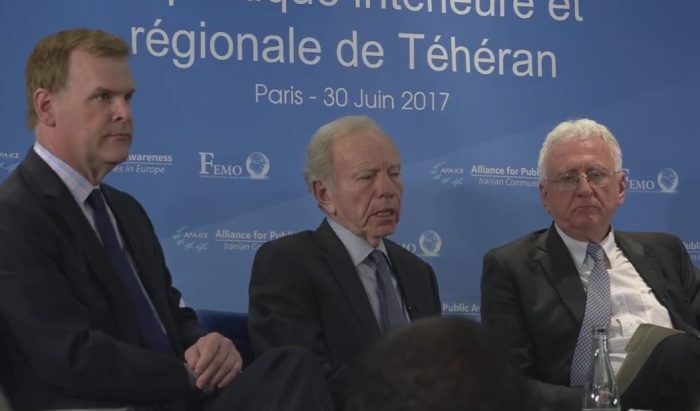 Former vice presidential candidate and Sen. Joe Lieberman expounded on the need for the Trump administration to hold the Iranian regime accountable for its actions and end the free hall pass the Obama administration gave in order to facilitate the nuclear agreement. That realization lent a sense of focus and urgency on the day’s discussions on galvanizing the energy created by protests in the recent presidential election in Iran in which outsized banners and posters of NCRI leader Mrs. Maryam Rajavi where seen hanging from freeway overpasses in Tehran; an almost unthinkable act just a few months ago that would have earned any perpetrator a quick sentence to the gallows. Struan Stevenson, president of the European Iraqi Freedom Association and former president of the European Parliament’s Delegation for Relations with Iraq, hit a key note when he called Iran the “godfather” of Islamic extremist groups likened Tehran’s influence among them. With the rise of ISIS enabled by Tehran’s interference in the Syrian civil war and political meddling in Iraq, coupled with the use of terrorist proxies such as Hezbollah and Houthi rebels in Yemen, the Iranian regime manipulated the global stage to create a map for itself of Shiite control ranging from the Mediterranean to the Indian Ocean. Michael Pregent, a fellow at the Hudson Institute and foreign policy analyst and former intelligence officer, described how the Iranian regime’s goals were to hold a navy base along Yemen’s coastline to control the flow of international commerce through the Suez Canal, and the creation of a land bridge running from Tehran, Baghdad and Damascus to move troops, goods, arms and supplies effortlessly. The military muscle flexing by Iran was cited also by former Gen. Jack Keane, former vice chief of staff of the U.S. Army, who discussed how President Donald Trump’s election has set the stage for regime change with a halt to the concessions granted the mullahs by the Obama administration and an increased willingness to confront Tehran in Syria, Yemen and other fronts. The panel discussion came in advance of a massive annual gathering held on July 1st by the NCRI and other groups to demonstrate the breadth and depth of the opposition movement and the broad international coalition supporting democratic change in Iran. Opening up greater support and recognition of the Iranian opposition movement to spur its growth within Iran similar to U.S. support of key dissidents such as Lech Walesa in Poland and Aung San Suu Kyi in Burma. The NCRI has listed a more complete 10-point plan for a peaceful democratic future in Iran and with the changing political landscape around the world, we may be as close to seeing it happen as ever before.